As anticipated, the Registrar of Voters updated the numbers at 5:00 p.m. Veterans Day. Here's how they look now. 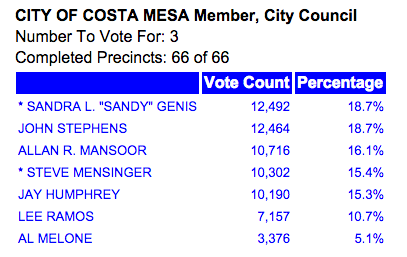 Sandy Genis and John Stephens remain well ahead in this race. She holds a 28 vote lead over him. 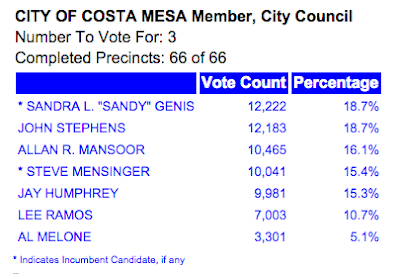 Allan Mansoor trails Stephens by 1,930 votes for the remaining spot on the council. Mayor Steve Mensinger remains 414 votes behind Mansoor (thanks to Honeyman for the catch). Jay Humphrey continues to lose ground on Mensinger. Lee Ramos is well off the pace and Al Melone is dead last. Incumbents Jim Ferryman and Art Perry continue to hold commanding leads over challengers. 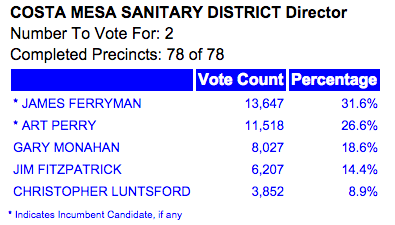 Ferryman leads Perry by 2,181 votes. 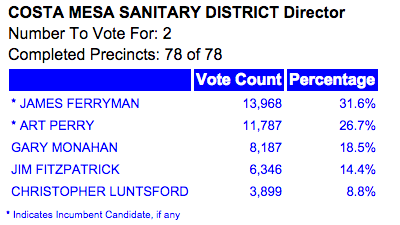 Perry's lead for the second seat over Gary Monahan has grown to 3,600 votes. 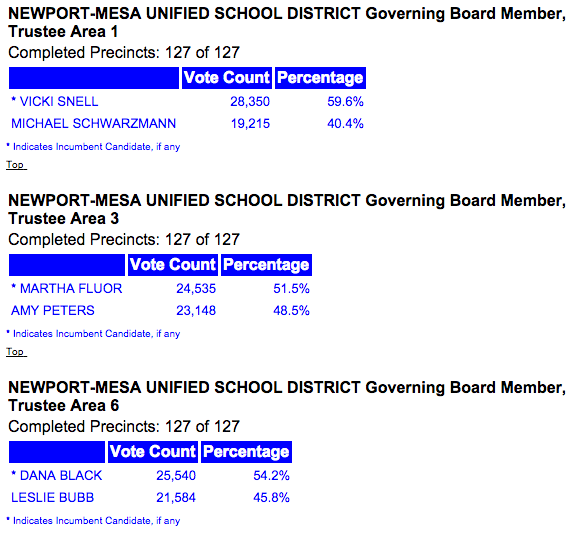 Jim Fitzpatrick and Christopher Luntsford continue to trail the field badly. 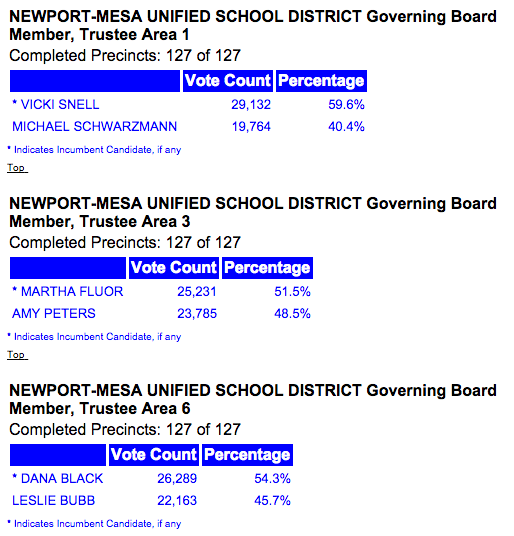 Incumbent Jim Fisler holds what certainly appears to be an insurmountable lead over newcomer Alex Reich. His lead continues to grow. Both citizen-generated measures, V and W, continue to fail badly while the City generated Measue X continues to pass. Both growth-related issues, Measures Y and Z, continue to pass, but the citizen-generated Measure Y has an overwhelming lead of nearly 4,000 votes. Citizen-generated Measure AA is passing overwhelmingly. 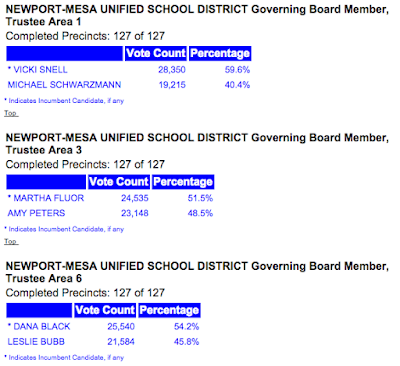 The City measure placed on the ballot to confuse the voters, BB, is failing. The bogus measure placed on the ballot by Mayor Pro Tem Jim Righeimer that provides for a 6-voting district model PLUS a directly-elected mayor, is passing handily. There was no organized opposition to this measure - I was the only person who wrote against it. This advisory measure is still passing with a similar ratio as the last report. 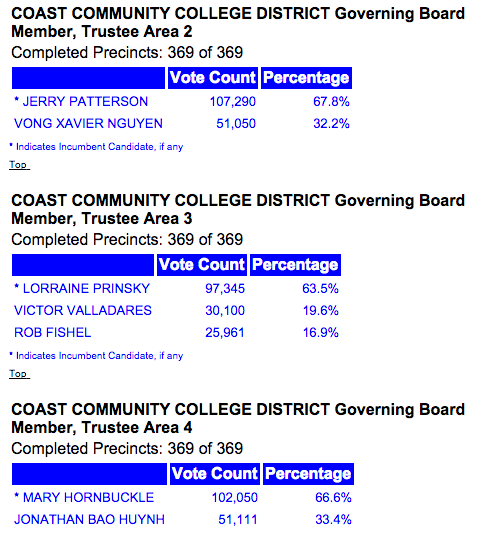 All incumbents continue to hold overwhelming leads in these races. 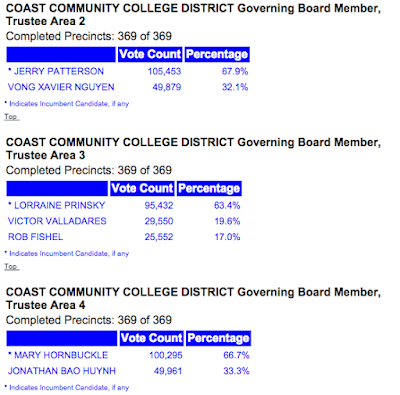 Dana Rohrabacher continues to hold a commanding lead over challenger Dr. Suzanne Savary. According to the ROV site the following ballots remain to be counted. 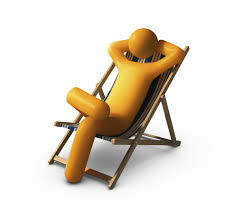 It is anticipated that the staff will work Saturday, but perhaps not Sunday. The next report is scheduled for 5:00 p.m. Saturday, 11/12/16. I'll report then unless anything exciting happens between now and then. Have a great weekend. Next week is going to be very busy for the City staff, with significant public meetings Monday through Thursday. I'll cover each individually, but here's a heads-up so you can plan your week. 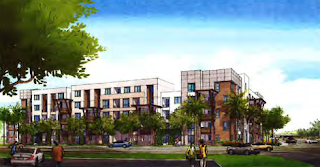 Costa Mesa Planning Commission meets at 6:00 p.m in City Council Chambers to discuss eight (8) sober living issues. 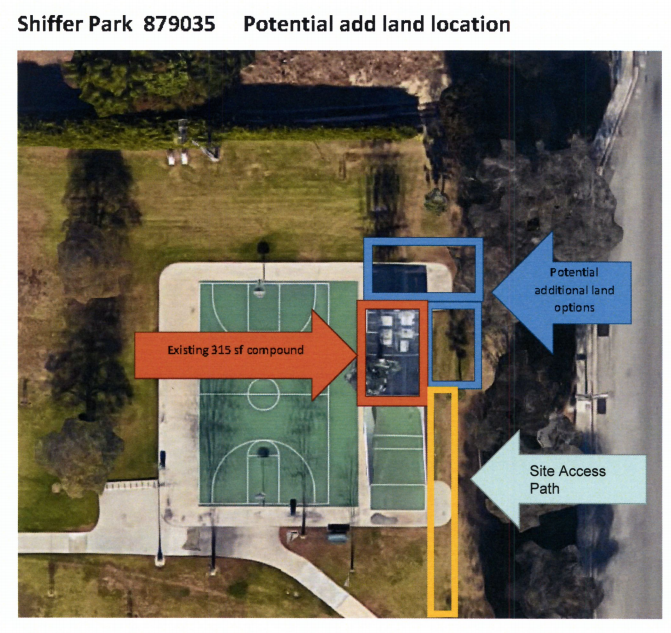 Other four development-related items on the agenda, HERE, will be continued to a special meeting on November 21, 2016. The City Council meets at 5:45 p.m. in City Council Chambers to discuss an agenda, HERE, that is packed with development-related issues. Also, the controversial Holiday night club is on the agenda. More on this agenda later. 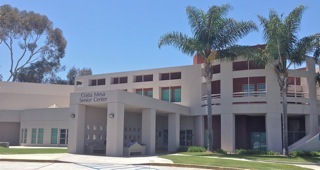 The Costa Mesa Senior Commission meets at 9:00 a.m. at the Senior Center, 695 W. 19th Street and has a very light agenda, HERE. The only item on the agenda is a discussion of some new Senior Instructional Class Proposals. The Costa Mesa Parks and Recreation Commission meets for the final time this calendar year at 6:00 p.m. in City Council Chambers. The agenda is thin, HERE. It covers one tree removal request, a discussion of Cell Site Upgrades at Shiffer Park and the Fairview Park Annual Report. 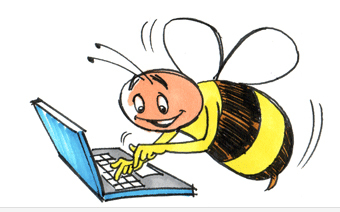 Today, while most of us pause to honor our veterans on this special day, Orange County Registrar of Voters Neal Kelley and his small army of worker-bees (240 strong) continue to plow through the mountains of ballots submitted in this election cycle. As I've said MANY times in the past few days, this election if FAR from over. You can go to the "What's Left To Count" page, HERE, for real-time numbers. Let me summarize it for you as of 10:00 a.m. Friday. That first number has gone up as the mail is delivered and it is anticipated that it will continue to rise today and tomorrow. I'm told by representatives of the Registrar of Voters office that they are working hard today and will do so through the weekend. Although there is no mail delivery today the ROV has made arrangements to go to the Post Office and retrieve all mail awaiting delivery. I'm also told that there continues to be a plan to provide daily updates at 5:00 p.m. each day, but that there may be no update on Sunday. I'm also told that, due to the tremendous volume of ballots turned in this cycle, it may take two more weeks to complete the counting and certify the results. They are required to complete this work within 30 days of the election. If it takes that long and the results are not certified until December 8th, then the Costa Mesa City Council results will NOT be certified until after their first meeting in December, on the 6th. I'll keep checking and reporting. 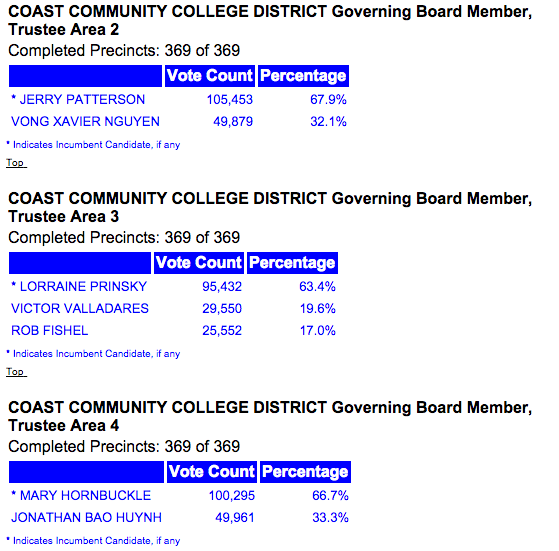 Here are the latest numbers from the Orange County Registrar of Voters as of 5 p.m., Thursday, November 11, 2016. In every case the ratios remained the same. No positions changed in any individual races and the Yes/No ratios remained virtually the same in all measures on the ballot. Sandy Genis picked up 300 votes; John Stephens gained 313; Allan Mansoor gained 249; Steve Mensinger gained 239; Jay Humphrey gained 230; Lee Ramos gained 148 and Al Melone gained 72. The two citizen-generated initiatives, Measures V and W, continue to fail. The city measure, X, looks like it will pass handily. The citizen-generated Measure AA continues to hold a overwhelming lead. The city-generated bogus Measure BB continues to fail badly. 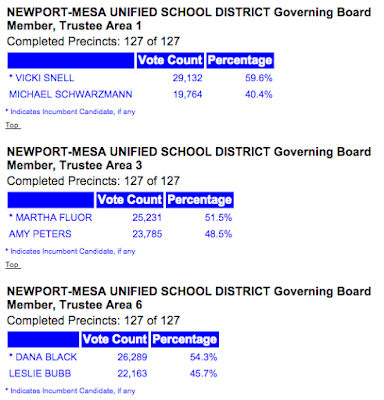 The measure hijacked by Jim Righeimer and placed on the ballot continues to show strength. 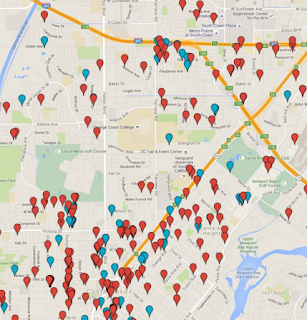 It will likely pass, much to the detriment of the residents of the city. This measure continues to lead but the NO votes gained ground. Dana Rohrabacher continues to hold a commanding lead over Dr. Suzanne Savary.